This question gives me flashbacks to my childhood and my parents urging me to eat things that didn’t taste good to me because they were “good” for me. Not much of a motivation to a 10-year-old. All I cared about was my mouth being happy. It never occurred to me that perhaps I would consume something for a reason other than the taste…like perhaps the benefit. 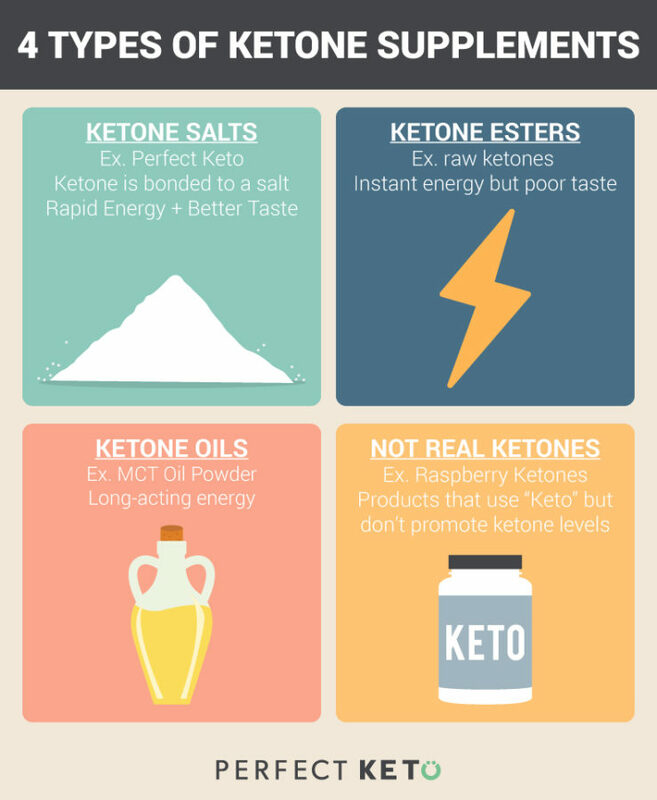 Later in life, learning to treat food as fuel for my body has changed my life and has become especially prominent in ketosis and dealing with the fact that exogenous ketones taste bad. Ketosis is a state of metabolism where our bodies use dietary and body fat for energy. To get into ketosis we need to drop all major carb sources and focus on high-quality fats. Removing carbohydrates from our diets cause most people lethargy and flu-like symptoms for a couple days to a week. To boost through this period, many people take exogenous ketones. However, exogenous ketones taste awful. 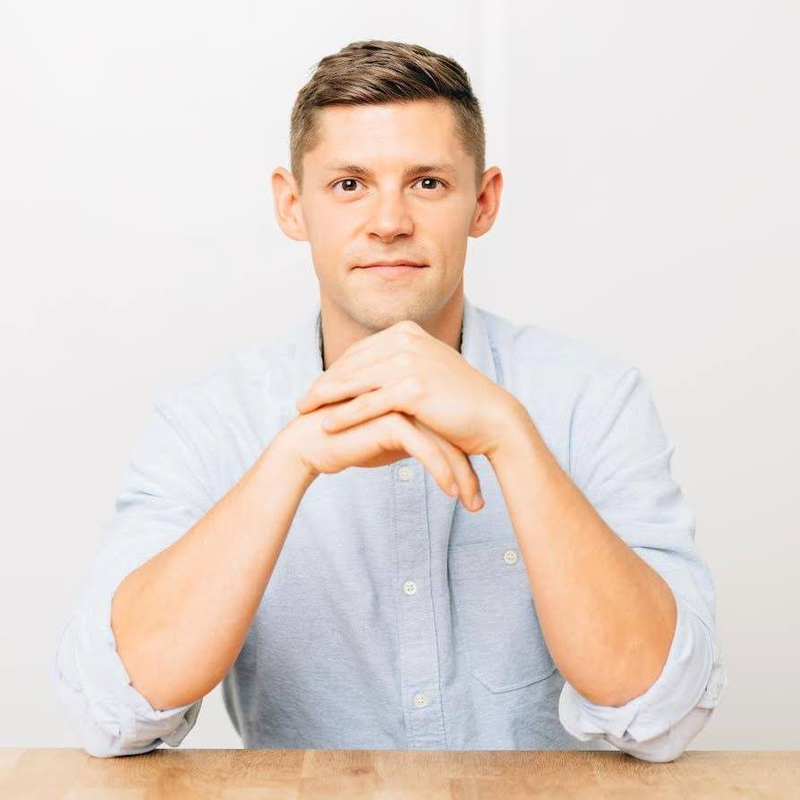 Tim Ferriss and Dom D’Agostino echo the sentiment. For a long time, taking exogenous ketone esters were reserved for only the most extreme bio-hackers. Why would someone consume something so awful? To get the benefits. Taking exogenous ketones is tremendously effective at raising blood ketone levels to boost performance, fat-burning, mental acuity, well-being, etc. To make ketones more palatable, manufacturers attach other molecules, (like calcium or magnesium) to create ketone salts. However, this doesn’t magically make them taste “good” or like Peaches and Cream ice cream bars on a warm summer afternoon with a slight breeze. Make no mistake, if we drink exogenous ketones for a great taste and pleasant mouthfeel, we will be disappointed. Case in point: Raspberry Ketones. Most flavors you’ll find in raspberry ketone supplements are artificial, and it’s much harder to find real raspberry ketones. In fact, most of the supplements you’ll find use mostly ground up anise seeds and with just a touch of real raspberry ketone. Most have to use fillers and fake ingredients to keep the supplements affordable. See our full post on Why Raspberry Ketones Have Nothing to do with Ketosis. On the flip side, if we drink exogenous ketones, we will get the benefits of exogenous ketones. Test your ketone levels to confirm this. Perfect Keto’s mission is to make ketosis accessible to as many people as possible. We do this through sharing ketogenic research, writing articles, creating recipes and guides, and also by developing exogenous ketones with the best possible taste while still prioritizing a completely clean product with maximum efficacy, above all else. 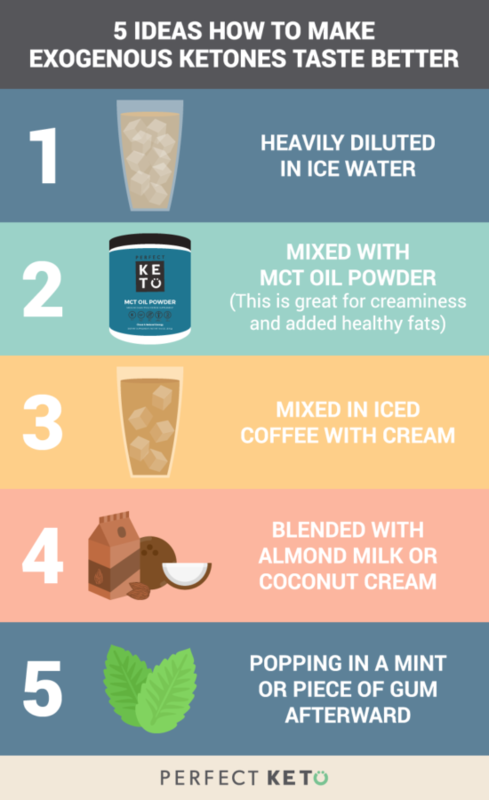 It may be tempting to just crush scoops of Perfect Keto to get as much benefit as possible, but we recommend ramping up your ketone intake. For many of us, our bodies haven’t run on ketones for decades, so this will be a huge shift in our normal functioning and we should treat it as such. Try ¼ scoop first, heavily diluted in water. This will help with the taste. Also, the process of ketosis removes water from our bodies, so getting lots of water will help with any dehydration and stomach issues. Ramp up from there, trying ½ scoop the second week or when you feel it’s appropriate, and then continue to iterate upwards. The reason we are drinking ketones is for the effect and benefits, not the taste… however, that doesn’t mean we can’t get creative right? These are some favorites from Perfect Keto HQ. To summarize, dilute or mix and try new things, then test your ketone levels to see the effects. If we come in with the demand of “having it all” and drinking a clean exogenous ketone product, jam-packed with high-quality Beta-Hydroxybutyrate, and have it taste like the drizzling milk chocolate from a Hershey’s commercial, we will be disappointed. We are drinking exogenous ketones, not for the taste and decadent flavor, but for the benefits of raising our ketone levels. This includes fat-burning, mental focus, energy for performance, transitioning into ketosis, and overall feelings of well-being. The fact is that noticing ketones don’t taste great is a good sign. This indicates the product has high levels of the BHB exogenous ketones we want. Test your ketone levels and share them with us! I like the taste. I was not in Ketosis, took the powder and was in right away. BUT It gives me diarrhea. If there is a way to add something to prevent that I sure like to know. I mix with coconut water, at least 10 ounces… I don’t mind the taste so much. Can I mix it into my bulletproof coffee in the mornings? I noticed that you suggested iced coffee. Is it supposed to be consumed cold? I have added the Ketones for the past week in conjunction with a detox regimen. I love the salted chocolate great in coffee, chocolate tea, protein shakes !! However I have yet to be in ketosis I am using about 1/2 scoop twice a day. My carbs are mostly in fruits and vegs which I don’t want to give up and my protein shake has about 15 grams per serving. I was under the impression that if you took exhaustion is key tones you didn’t have to omit all carbohydrates. Reducing carbohydrate intake to 20 to 50 g per day is extremely odious . Thanks for sharing your thoughts on ketones weight loss. I took a scoop with almond milk but I got soooo sleepy?! is this normal, am I doing it wrong? I thought it was suppose to give me energy? thanks in advance! I bought Perfect Keto, Salted Chocolate. I find it excessively sweet. I can hardly tolerate 1/2 scoop in 8-12 oz of liquid (smoothie, bullet Proof coffee or tea). I am in light ketosis but was hoping to elevate my level with Perfect Keto exogenous ketones. What do you suggest? Also, is there a plan to reproduce with less sweetener? What ketone product is recommended to take? Can you mix it with orange juice to help with the taste? As far as the taste goes, I tried the salted chocolate and found it too sweet. Has anyone compared that to the peaches and cream as far as the fake-y sweetness angle? Would you think I should try the peaches ones or just return the chocolate for a different product?